Best ever? 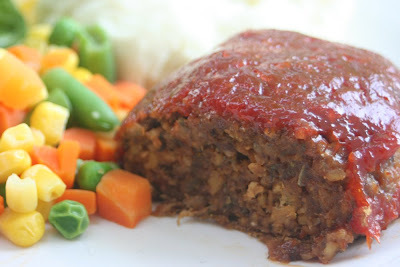 I suppose that's a little subjective, but it certainly is the best meatless meatloaf I have ever had. I have tried lentils, nuts, TVP, and bulgur wheat to replace the ground beef, but tempeh is the far better alternative. It makes sense, really, since tempeh makes such a perfect burger. If you find that tempeh has a certain "taste," simmer it in water for 10 mins to cut the bitterness. Combined with a sugary-ketchup glaze, you and your kids will love these meatloaves. Serve them with some mashed potatoes and mixed veggies on the side for a down home meal. Makes 10 mini meatloaves. 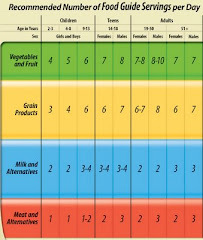 Cut in half if you aren't feeding 3 growing boys. 1. Mix grated tempeh, onion, garlic, oatmeal, flour, and spices in a large bowl. The spices are really up to you. I like a well spiced and complex flavour. 2. Add in sauces and oil, and enough water so you are able to mash everything up with your fingers. Knead/mush/mash for a few mins to mix everything well. 3. Divide dough into 10 pieces and shape into small loaves. Actually, they end up looking like lumps/rocks, not really laoves. Place into oiled pan. 4. Mix together ingredients for the glaze and spoon evenly on top of each loaf. Make sure the whole loaf is covered. 5. Bake, uncovered, for 50-60 mins, until glaze darkens. Have leftovers? 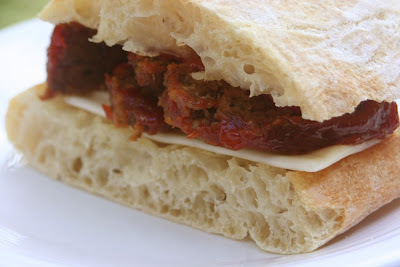 Slice up a meatloaf or two and make a sandwich!